The Pentagon is looking to make its communications systems more resilient against interference or hostile jamming. One way to do that is to allow users of satellite communications to roam across commercial and military networks. WASHINGTON — The ability to roam seamlessly across multiple satellite networks is something that cellphone customers take for granted, but is not commonplace for users of military communications systems. The Pentagon is looking to make its communications systems more resilient against interference or hostile jamming. One way to do that is to allow users of satellite communications to roam across commercial and military networks so if one system is disrupted they can switch to a different provider. But efforts toward that goal have stalled in recent years as the Defense Department studies what upgrades are needed to the military’s ground equipment — an inventory of about 17,000 satellite terminals. Many of these terminals were designed to support military satellites, and reconfiguring them to operate with commercial bands can be an expensive and laborious process. A breakthrough of sorts appears to have been achieved in a recent Air Force funded experiment carried out by Kratos Defense & Security Solutions. 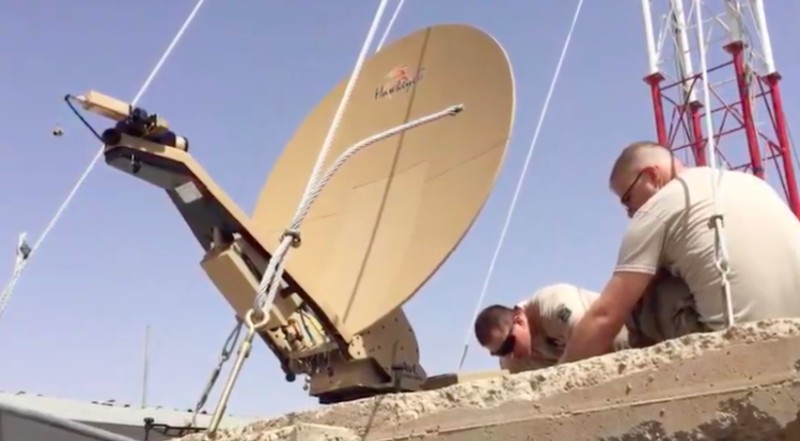 The company announced Monday that it demonstrated that satellite communications terminals that military forces use in the field today can be set up in minutes to roam across different commercial networks. For the experiment, Kratos developed a prototype network management system. It used gateway equipment representative of current U.S. government infrastructure. The terminal selected for the test was a Special Operations Forces Deployable Node, based on the Hawkeye III Lite made by L3, Frank Backes, senior vice president of Kratos, told SpaceNews. This terminal is typically used in Ku-band but is capable of Ka-band and X-band when those options are purchased, he said. With the Ka-band and X-band options it can support the military Wideband Global Satcom (WGS) system along with commercial satellites. Operators during the test roamed from an Intelsat to an SES commercial satellite network. But other service providers could be added to the same architecture, said Backes. One significant takeaway from the experiment, he said, is that the military does not need to buy brand new terminals to get roaming services. With minor updates to legacy terminals, the company said in a news release, the military can get access to multiple satellites and services, including Time Division Multiple Access (TDMA) and Frequency Division Multiple Access (FDMA) networks. The roaming test was part of an Air Force pilot technology demonstration project that is looking at ways to use commercial satellite services to lower the cost and increase the resiliency of military communications. The pilot was directed by Congress in the Fiscal Year 2016 National Defense Authorization Act. Hughes Network Systems in May announced it was selected for the Air Force pilot program to develop a “flexible modem interface” for military terminals to enable roaming across commercial and military satellites. Hughes announced in December that the flexible modem interface demonstration was successful. “The Air Force was very pleased as the demo showed them that this capability was real, not just a design,” a Hughes spokesperson said in a statement to SpaceNews. The flexible modem interface is a “network management capability” that works with legacy and other modems, according to Hughes. The Air Force demonstration was done with modems already in the military inventory. The modem for the demonstration, provided by ComTech, is used by the Army and Navy. Defense officials have said DoD does not intent to replace most of its 17,000 satellite terminals. “That’s why this demonstration was so critical,” said Backes. Only Intelsat and SES satellites were part of this experiment, he said, but the architecture is adaptable so it can support more commercial providers and WGS. In the next phase of the Air Force pilot program, vendors will be asked for ideas on how to “operationalize” what was achieved in the experiments. One option would be to provide DoD the software to set up the architecture to manage terminals in the field and manage the network from end to end. Backes said that during the next and final portion of the pilot program, government officials will be able to weigh the cost of adding a new modem interface or modifying an existing terminal, for example, against the benefits of having access to a hybrid network of multiple satellite providers. “This is still a debate; that’s part of this process,” he said.